A star at tight end for Temple University’s football team in the early 1970s, Randy Grossman went unnoticed in the 1974 NFL draft. Signing as a free agent with the Pittsburgh Steelers, he went on to play eight seasons of professional football. 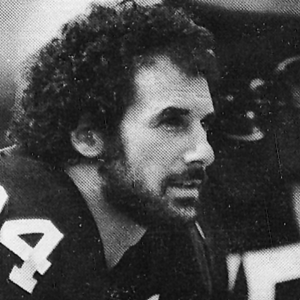 As a member of the Steelers during their reign of NFL supremacy in the 1970s, Grossman was on the winning side in four Super Bowl games. He caught a touchdown pass in Pittsburgh’s 21-17 win over the Dallas Cowboys in Super Bowl X in 1978. The same year, he established personal marks with 37 receptions for 441 yards. In 1976, he made four clutch receptions against the Oakland Raiders in the American Football Conference Title game. During his pro career, he caught 118 passes for 1,514 yards and five TDs. He was considered one of the NFL’s most sure handed receivers with a tremendous ability to get open for passes as well as a determined runner after catching the ball. He was a starter at Temple for three years and as a senior in 1973, was named to the AP Third All American Team. Temple’s 9-1 record his senior year was the best in Owls’ history. He also earned All East honors and was invited to play in the North-South Game. Temple football Coach Wayne Hardin called him “the best tight end I ever coached”. During his junior season, he caught 23 passes for 349 yards and three touchdowns. As a senior he led Temple in pass receptions with 39 catches for 683 yards and four touchdowns. Grossman was also a standout player for Coach Stan Freedman at Haverford High School earning numerous honors, including All-State, All-League and All-Delaware County.